This GABF silver medal winning Porter from Fairfield, California's Heretic Brewing Company is only available sporadically in the market, which is too bad as it is just about a perfect example of a robust porter. Not overly bitter, but not sweet either, this hits all the right notes for a classic dark ale made with nothing but water, yeast, hops, and malt. A tasty meal of a beer that is sure to please on a cold night. A side project of Chelsea's Mystic Brewery, Von Lune focuses on lagers and so far exclusively on the Von Lune Pilsner, their version of a Czech-style Bohemian Pilsner. One of the more striking things about the can is that the stamp on the bottom is not a born on date, or even a best by date, but in fact a "Ready On" date (1/25/209), as the folks at Von Lune can condition their beer for a few weeks before deeming it ready to drink. It's ready to go now, and super bright with crisp Saaz hops and a nice pale malt backbone. Flavorful, and easy to finish, this is a great brew. This decade has seen several new Trappist breweries including, most famously around here, Spencer Brewery in central Massachusetts in 2013. That same year also saw the beginning of Brouwerij De Kievit in the Netherlands. But just as St. Joseph's Abbey in Spencer has a history dating back many years, Abdij Maria Toevlucht's story begins in the late 19th century with abbots fleeing Mont De Cats in northern France in the wake of the French Revolution. After bumming around in various places and taking refuge at Westmalle, they eventually established a priory that was given official abbey status in 1938. The monks recently discontinued their cattle farm in favor of creating a brewery where they make Zundert 8, a beer they describe as "slightly unruly." I would tend to agree with this assessment. It's a classic Belgian beer for sure, no doubt about that, yet it is a bit more bitter than most beers of this style. Further, it's certainly too light in color to be considered a Dubbel, yet way too amber in color to be a Tripel. What is it? A Trappist amber? A two and a half? 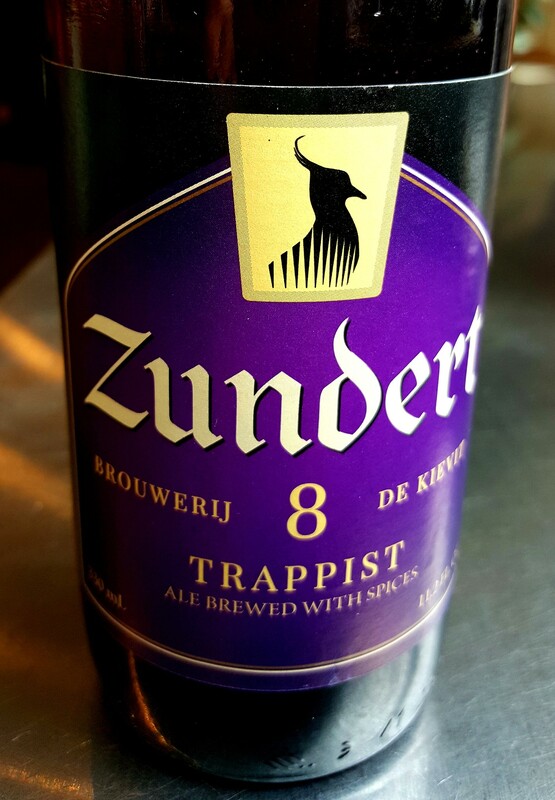 At the very least, Zundert 8 is a unique addition to the world of Trappist beer. Here's a great, classic, fruity British bitter that does about as well as any at emulating the taste and flavor of actual cask beer. Perhaps a touch more bitter than most of this style (which despite the name "bitter", isn't bitter at all by American IPA standards), Bluebird is bursting with flavor even if you aren't able to serve in the manner the bottle recommends, at 58 degrees in a straight pint glass at the Black Bull Inn in Coniston, Cumbria. Great Divide's famed Yeti Imperial Stout has spawned many flavored variants, ranging from Chocolate Cherry, to Maple Pecan Yeti, to this here Chai Yeti. To be honest, Chai Yeti didn't sound particularly appealing to me as I'm generally not a fan of beers that heavily rely on novel ingredients. So it was a pleasant surprise when this one not only went light on the spices, but kept the delicious bitterness of the regular Yeti intact. Indeed, some might actually want more spice and sweetness in this beer. Not me! This Yeti seems to have me figured out. Sip slowly, and maybe share with a friend, this bomber is a hefty 9.5% abv. When tallying up the value of this month's beer pass I realized that it only slightly exceeded the $50 mark, so as a fun bonus we're throwing in this one from Italy's Lurisia Premium Beverages. Made with their famed mineral water, and a malt blend featuring both barley and buckwheat, this saison style ale also uses wine yeast instead of the traditional brewer's yeast. It's a pretty interesting beer, but it probably should have been consumed several months ago, to be perfectly honest. All things considered, this beer has held up quite well with persistent carbonation and a nice light, yeasty, fruity feel. If you like it, you'll be pleased to know you can purchase more for a mere two dollars a bottle! If you hate it, well, like I said, it was a fun bonus. Sorry!